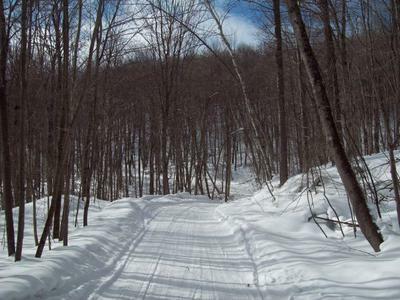 In 2010 I was walking along a road by Loon Lake, near Haliburton, Ontario, and came across these tracks. 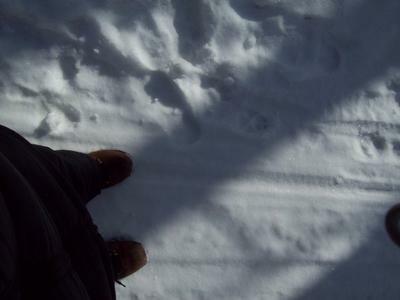 It was early morning in Winter, maybe 7:00 or 8:00 am and snow had fallen the night before. The only boot tracks were from me and maybe a snowmobile or two. Most of the cottages were empty. 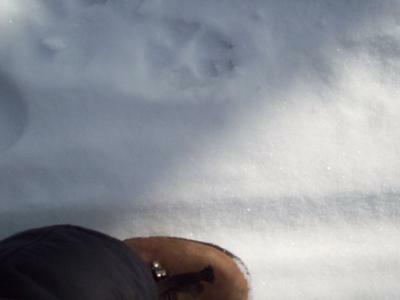 I was walking by myself taking photos of the animal tracks, which were very clear, when I saw the tracks of a large canine. There was two tracks running parallel, very straight and purposeful, either side of the road where it veers away from the cottages into the woods. I have included my boot in there coz I am a size 40 women's shoe and these hiking boots are even bigger and fit two pairs of thick socks. To this day I want to know if they were wolf, dog or coyote. My initial reaction was to freeze, as they looked so big to me and I suddenly felt very alone. I headed back pretty quick! The people I was staying with have seen a Wolf here before, I am told, and there is a Wolf Sanctuary close by. Any help on whether this is a wolf track would be appreciated. Thank you so much, Amy, for writing to us and including your great pictures. I don't know what other people will think, but in my (never humble!) opinion, I'd say that they look like Wolf tracks to me!